​Free Your Soul Through Painting! What is Sacred Space Painting? ﻿Sacred Space Painting is the name of my process arts studio. I have dedicated it to be a safe and supportive space for creativity to flourish in each person who walks through the door. Here you will find lots of natural light streaming through, an incredible view of downtown and the mountains, an array of vibrant paints, large smooth sheets of painting paper, and high quality supple brushes. I facilitate Intuitive Painting Workshops and Classes out of this Sacred Space. Intuitive Painting is about opening to the creative life force energy that flows through all human beings and is our birthright. 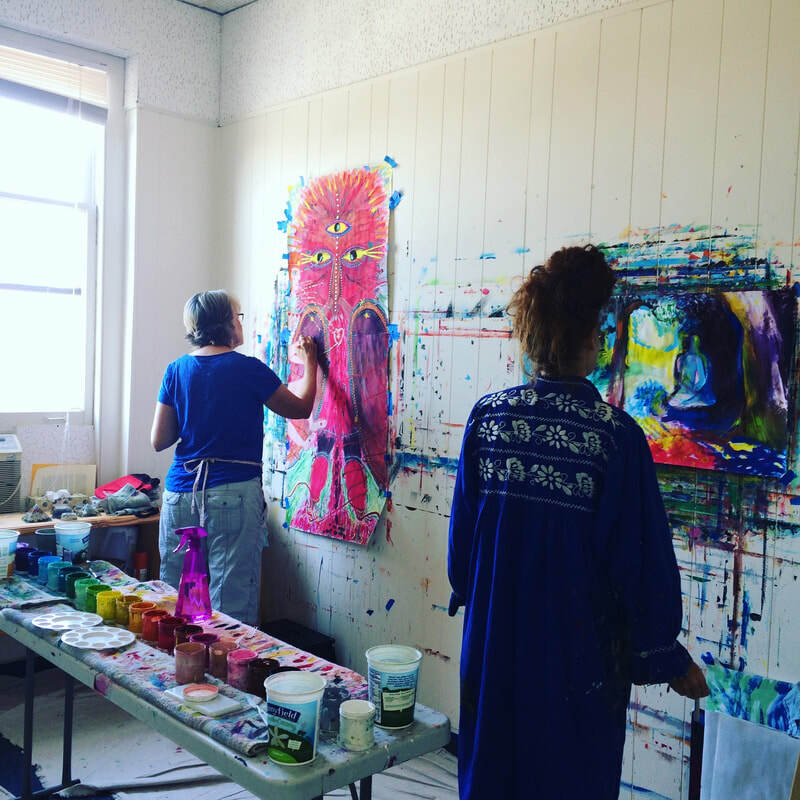 Unlike regular art classes, at Sacred Space Painting there is no emphasis on product, technique or critique. ​Intuitive Painting is about falling in love with the journey of creative invention, exploration and present moment authenticity more than being attached to the end result. Here there is no right or wrong, good or bad, no points of comparison. Your painting is totally unique because you are totally unique. Who might like to take an Intuitive Painting workshop or class? Anyone who wants to rediscover the childlike passion of being free to create even if you have never painted. Or for the artist who wants to bring new passion and aliveness to their work. Anyone who is hungering for a more authentic and heartfelt way of being and a deeper level of self expression. This process connects us with our innate wisdom and knowingness. When we touch the brush to the paper we are touching a deeper level of connection with ourselves. ﻿We get to see where we censor ourselves or stop our flow. What thought forms are in the way of being free? We get to travel the vast landscape of our inner worlds through painting. Where might this journey lead? We are stepping into the unknown with each painting. With each brush stroke. No matter what we are feeling; delight, sadness, doubt, anger, or bliss the painting can handle it. We can just relax into the process and enjoy the exhilarating ride.